As e-discovery purveys more and more practices and practice areas, it becomes important for solo and small firm lawyers to at least have a cursory understanding of the process. Attorneys can be at a big disadvantage coming up against opposing counsel without the proper knowledge, workflow and tools for e-discovery. Since everyone today texts, emails, uses social media and other electronic forms of communication, almost every case involves electronically stored information (ESI) and therefore requires e-discovery. So where should small firm lawyers go to get caught up? In this episode of The Legal Toolkit, Jared Correia interviews senior information technology manager Kyle Albert about what ESI is, how solo and small firms can manage e-discovery in-house, and, when outsourcing, what to expect from an e-discovery service provider. ESI is an industry term, Kyle explains, for any digital data including computer documents, emails, or even Facebook messages. Any lawyer researching or gathering electronic data is already doing e-discovery, but maybe not very well. Kyle suggests informative e-discovery blogs and videos, discusses in-house software and vendors, and recommends cost-lowering solutions for law using a service provider. Although many lawyers think that e-discovery is a big budget process that only the AMLaw 100 firms are doing, it’s actually a reality for almost every attorney today. Kyle Albert is a managing partner at Fox Hound Information Management. He is a senior information technology manager with over 18 years of experience in ESI management, computer networking, mobile and web development, databases, service administration, end user support, and project management. At Fox Hound, Albert conducts forensic acquisition and preservation of ESI, manages document processing operations, and supports e-discovery document review, database administration, and data mining. Advertiser: Welcome to the Legal Toolkit; bringing you the latest legal trends and business initiatives to help you manage your law firm. Here are your hosts – experienced lawyers, writers and entrepreneurs, Heidi Alexander and Jared Correia. You’re listening to Legal Talk Network. Jared Correia: Hello and welcome to a new episode of the Legal Toolkit on Legal Talk Network. Hi mom, thanks for listening. If you’re a returning listener, welcome back. If you’re a first time listener, hopefully you’ll become a long-time listener. I am your host, Jared Correia. And in addition to casting this pod, I’m also the assistant director and senior law practice advisor with the Massachusetts Law Office Management Assistant Program. LOMAP provides free and confidential law practice management consulting services to Massachusetts attorneys. For more information on LOMAP’s offerings, visit our website at MASSLOMAP.org. You can also buy my book, Twitter in One Hour for Lawyers from the American Bar Association, on iTunes, or on Amazon. My co host, Heidi Alexander, is with me again next month, when you will have only to pine for my return the month after. On the Legal Toolkit, we provide you each month with a new tool to add to your own legal toolkit so your practices will become more and more like best practices. In this episode, we’re going to talk about ediscovery, because traditional discovery is just so non-electronic. As ediscovery provades more and more practices and practice areas, it becomes more and more important for solo and small firm lawyers to at least have a cursory understanding of the process. So, let’s release the foxhounds. Kyle Albert is our guest today. Kyle Albert is a managing partner at Fox Hound Information Management, a sweatervest ivisionato, and his profile picture on Skype makes him look like a Ryan Gosling lookalike. He is a senior information technology manager with over 18 years of experience in ESI management, computer networking, mobile and web development, databases, service administration, end user support, and project management. That’s a lot of stuff for one person to know. At Fox Hound, Kyle conducts forensic acquisition and preservation of ESI, manages document processing operations, and supports e-discovery document review, database administration, and data mining. He’s particularly adept at managing resources in line with schedule and budget, providing training and support and making workflow and technology recommendations. Kyle, welcome to the show. Kyle Albert: Thank you very much, Jared, I am really excited to be here. I have been listening to this show for a little over a year. But I do have to say in my podcast listener, I usually listen to podcasts at 1.5 speed, so you sound a little bit strange on normal speed. Jared Correia: I’m sorry. I’ll try to slow it down or speed it up as you wish. And Kyle, just so you all know out there who are listening, he was really patient on waiting for me to arrive today. He’s a saintly man. Are you ready to do this thing? Kyle Albert: I am ready. Jared Correia: And a fan of the show! Jared Correia: You can join the fan club with my mom, this is very exciting. The meetings have been sparsely populated, that’s for sure. Alright, let’s talk about ediscovery and some other stuff. Jared Correia: So let’s start it at a very basic level for you. ESI, what does that stand for, what does it mean, and then can you outline the major differences between traditional discovery and ediscovery? Kyle Albert: Yeah, sure. So ESI – and one of the things we’re going to talk a lot about today are a lot of the jargon terms that are associated with this field, and unfortunately there’s quite a few of them. But ESI just stands for electronically stored information. So it’s just a fancy way of saying any data or information that’s stored electronically, or you can say digitally too, if you want. So if you think about it, all of us today are doing things on email and we work on our computers all the time and we’re not dealing with a lot of paper anymore. So really, ESI is most everything that we do in our day to day lives these days, whether it’s social media or email or texting or what have you. And so the way that relates to lawyers is when we’re talking about discovery, and we all should know as lawyers what discovery is, hopefully. Jared Correia: Yes, let’s hope. Kyle Albert: So we won’t go into a lot of explanation about what discovery is, but ediscovery is just basically the same process as discovery but dealing with electronically stored information or ESI. So instead of dealing with like in the old days you had boxes and boxes of paper, and now that’s just not true anymore. Now you’ve got to worry about collecting emails and other electronic documents. And the problem is that it’s easy to say that ediscovery is just like regular discovery except everything’s digital, yay. But it’s not that simple because once you’ve made everything digital and it’s scattered all over the place in different systems, it starts to become really complicated in a hurry. And it doesn’t help that most lawyers aren’t super technologically savvy. I think the listeners of your show are a little bit different. Kyle Albert: If you’re listening to a podcast as an attorney, you’re definitely more tech-savvy than most. But regardless of how comfortable you are with technology, when you’re talking about doing discovery with electronic data, there’s a lot of different processes involved and there’s different terms you have to understand and sometimes you have to educate the judge on some of this too; so it gets complicated in a hurry. Jared Correia: It was all sounding so simple until the very end there. Now what if you’ve got an attorney who has never had to deal with ediscovery before? Do you think there’s a likelihood at some point – and I think I probably know the answer to this – that that attorney is going to have to deal with ediscovery? And so how much an attorney who doesn’t necessarily deal with ediscovery issues on a regular basis bone up on the subject? Kyle Albert: What I like to tell people is if you’re dealing with discovery and you’re dealing with any electronic data, you’re already doing ediscovery. So there’s this notion out there amongst some attorneys that ediscovery is this big, scary, crazy process that only the AmLaw 100 firms have to deal with and it’s only in for really huge cases. But the reality is it’s becoming the way we do litigation these days. So what I tell attorneys is look, you may not think you’re not doing ediscovery, but you probably are, and you may not be doing it very well but you are doing it. And the problem that could really bite you is there’s two problems. One is if you come up against opposing counsel that really knows what they’re doing when it comes to ediscovery, they can really hammer you if you aren’t really familiar with the processes and what are the best practices. And if you don’t have a good practice and workflow in place for your team and you don’t have some good tools to use for it, you can really get in trouble just in the sense of trying to do the best that you can for your client. So that’s one of the reasons, and then frankly, sometimes, you may get into a case where maybe you’re in federal court and you’ve got a judge who understands it a little bit and if you don’t have at least the basic understanding of what you need to know and sometimes they say you need to know enough to know that you don’t know everything, or know what questions to ask. So sometimes that’s important too, just knowing that maybe I can’t handle this completely at my firm, but I know enough to know when I need to get some help from an ediscovery service provider and what kind of help I need to be looking for. Jared Correia: Yeah, that’s sort of the original socratic method, right? You’ve got to know what you don’t know. Kyle Albert: Yeah,we’ve seen it, we’ve had clients come to us who have said, “You know, I just got burned on a case because the other side was really good at it and I wasn’t.” And what we try to help them do is learn how to get good at it so they’re not going to find themselves in that situation again. Jared Correia: Okay, so ediscovery, important topic. I think we can both agree on that. It’s either here for you now or it’s coming for you. So do you remember the X Files, Kyle? The X Files that’s returning to Fox? Jared Correia: I’ve been talking with your colleague Tracy Gartman about that. Now that it’s back on the air, I’m afraid my wife is going to try to leave me for David Duchovny. However, if you’ve got your Molder and Scully, big flashlights out and you’re trying to begin your voyage of ediscovery as a curious lawyer who doesn’t really know a whole lot about it, how would you suggest somebody start? Kyle Albert: Yeah, very clever, and he talks a lot about these issues, and I actually used his site a lot. When we started Fox Hound a couple of years ago, I was coming at this from a background in technology, but I had never really done this in relation to the legal field and didn’t really know a whole lot about ediscovery, so I had to get up to speed myself. So his site is really good for that. There are some great videos on YouTube. In fact, we did a video – not to toot my own horn – but we did a video a couple of months ago with the American Bar Association and they did it via Google Hangouts and they recorded it and put it up on YouTube. And it’s sort of an ediscovery 101, it’s like a one hour presentation and the title of that was “Ediscovery for the Small Firm Lawyer.” So if someone just goes to YouTube and searches for that, it’s like the number one hit there, so that’s not a bad place to start. And then when you want to start diving a little bit more deeply, you can do things like go to the Sedona Conference website. The Sedona Conference is a group of attorneys and judges and people in the industry and folks who regularly come together to try to help shape the guidelines and the federal courts look to Sedona a lot for shaping the rules of civil procedures as it relates to ediscovery. Jared Correia: Yeah, Craig Ball, Sedona Conference, that’s what I’ve heard from several ediscovery lawyers as well. Now did you just say you are not a lawyer? Kyle Albert: That is true, I am not a lawyer. I’m a tech guy, I’m a tech guy, I’m a programmer, I’ve done all of that kind of stuff. And I’ve had to learn the world of the legal profession somewhat, and I kind of look at the IT world and the legal world as sort of mirror images of each other almost, because we each have a lot of jargon and a lot of terms that are very mysterious to outsiders. And so we each sort of look at each other and feel like at some point I can try to understand you, if I just study you long enough. Jared Correia: Yes, you’re squaring each other up. I only ask because you just seem really pleasant. Now we touched on this a little bit, but can, do you think, solo and small firm lawyers handle ediscovery mostly in-house, and if so, to what extent can they manage that? I mean, somebody who has looked into it a little bit, at least. Kyle Albert: Yeah, it’s a good question and we see it a little bit. We talk to a lot of attorneys who we’ll meet them at a conference or something and we’ll ask them, “So how are you dealing with this today?” And they’ll say, “Well, we just kind of try to deal with it on our own and I have some people on my staff who are pretty good at dealing with computers.” And if you’re talking about smaller cases, that’s probably okay. It still is probably a good idea to learn some of the terminology and learn a little bit about the processes and best practices. So reading somebody like Craig Ball is real good for that. Where it gets real tricky in a hurry is once you start getting anything beyond a few thousand or maybe 100 documents, once you get to that level, it starts to get hard to deal with it completely in-house unless you’ve gone out and invested in ediscovery software. And if you’ve done that, then you still could do it probably in-house, or maybe you could go with a Cloud service provider who provides an ediscovery platform that you can use in the Cloud. That’s a really good idea to think about, specially if you need to have more than one person looking at documents at a time. Or you need to be able to do it from a location other than just, say, the office. So it’s one of those things where it’s kind of a continuum where you can start doing it in-house and trying to figure it out, but you’ve got to make sure you’ve got the right skillsets on your team and that you can deal with things like what happens if you get a production from opposing counsel where you’ve got PDFs, and inside, each PDF is thousands and thousands of documents because they’ve grouped them all together in a single PDF. Are you going to be able to do your review efficiently in that single PDF or are you going to want to split that file up into multiple files and try to manage them separately as their own documents and do you know how to do that? And so those are the kind of things that you’re going to have to grapple with if you try to do it all on your own. So you can quickly get to a point where you might want to bring in somebody outside – a consultant or a service provider – who could help you out and deal with those things. Jared Correia: You mean like rather than changing your name and moving to Mexico, that’s probably a better idea. Kyle Albert: There’s always that option. Jared Correia: Now hold on that thought on vendors and products, we’re going to talk about that. But right now we’re going to take a break. Thanks, Kyle, for an exciting first helping of the Legal Toolkit today, things have been great so far. When we come back, we’re going to talk some more about ediscovery with Kyle Albert of Fox Hound. Jared Correia: Alright, welcome back. As previously, we are still joined today by Kyle Albert of Fox Hound, and we’re talking about ESI, ediscovery, and whatever else comes to mind. So Kyle, let’s get back into that question we left off on when we ended the first half of the show. If lawyers can’t or even don’t want to manage or handle ediscovery in-house, what choices do they have when we’re talking about software vendors that are out there? Even tools that they could use. Kyle Albert: Well, there are many things in the technology things, there’s a lot of choices actually. And I think a good idea to do is if you’re thinking about looking for someone to help you out with this, I would recommend sitting down and maybe doing a quick ten-minute self assessment first to figure out what do you actually need. Because like I said, maybe you feel fairly comfortable in dealing with all of the aspects of dealing with electronic data, except for you just need a good place to put the data where it can be accessible for you and your team. So you might want to look at somebody who really focuses on Cloud hosting for review, and there’s a lot of choices out there for that. You can get on Google and search for that, you can call somebody like me. I mean, we do do that, but we can also point you to other people who do things like that. What we provide at our firm is more of a full service capability. Now some people only need parts of that, but if you look at it and you say, “You know, I am just really unsure of how to deal with this in any way, shape or form from the beginning when we’re identifying and collecting data all the way to the end where we’ve got to produce documents, I’m really unsure of what we’re going to do here. I’m really new to this so I need some help.” So somebody like us may be better for you in that situation, somebody who can step in and help you out the whole way through and really hold your hand through the process and help you get through it. So it kind of depends on what you’re looking for. There are still people who are selling products that you can buy and install on your computers and your office if you want to go that route. ANd there’s a couple of articles out there that talk about how to cobble together some tools to let you do ediscovery on a real tight budget and just do it on your own in-house. And so it kind of really depends on what you’re going to need and what level of skills you’ve got on your team at your firm and what you’re comfortable doing. And also, frankly, where you think it’s better to spend your time. What I tell a lot of attorneys is, “Look, you didn’t bother learning how to install a telephone system to set up the telephones in your office. You paid an expert to come in and do that for you so that your time could be freed up to focus on practicing law. So I kind of look at this as the same kind of thing, it’s probably a better idea to let an expert come in and act as part of your team, but somebody who can kind of go away when you don’t need them anymore. Jared Correia: oh yeah, totally, and I think it depends on the personality of the attorney too. You have a lot of attorneys who are comfortable being that sort of DIY person, and then you get attorneys who want to firm it out for whatever reason. They don’t like it or they find their billable time more valuable. Jared Correia: So let’s continue that riff of a service provider. Let’s say you want to go with a service provider, like full-scale service provider. How would you vet that company as a lawyer? Kyle Albert: So I actually tell people there’s a few questions that you should ask. The first thing is you should talk to them. You should pick up the phone and call them or have them call you. I wouldn’t just look at their website. As we all know, everybody’s going to try to paint themselves in the best possible picture on their website, but talk to them. Talk to somebody there and find out a little bit more about them. So some of the questions that you would want to ask them are things like what are your areas of expertise or what services do you provide. Because like I said, some services only provide the hosting service, and that’s fine if that’s all you need. But if you’re going to need more than that, if you’re going to need help at some point, then you might not want to go with somebody like that. Because if you get to a point where you need help, say crafting your search strategy to try to find some particular set of documents, well that service provider isn’t going to be able to help you with that. So talk to them and figure out what do they do and where’s their level of expertise and do they offer consulting for helping you out with some of the more difficult parts of the process. And then, ask them what their pricing model is. There’s a lot of different pricing models from different ediscovery vendors. And some of them are frankly, I will say, I don’t know if they’re trying to make it less transparent than it ought to be, but sometimes it’s kind of hard to understand, I guess. When somebody tells you it’s going to be a certain number of dollars per gigabyte, well I don’t know how helpful that is when you have no idea how many gigabytes of data you’re looking at in a case. So find out where their pricing model is in. And more than that, ask them to provide you with some examples of how their pricing model would work in certain cases. And in particular, if you already have a case in mind – which is usually when attorneys are out looking for help when this stuff is when they have a need for it – give them some of the particulars of your case, and say, “Okay, this case I think is going to go for this many months, I think I’m going to have this many people reviewing documents, I think we’re going to have roughly this much data or roughly this many documents that we’re going to need to review.” Ask them to give you some idea of how their pricing model would end up pricing out for that service. Jared Correia: Yeah, it sounds to me like the best approach is to talk to the provider before you jump in on a contract, which probably makes sense generally if it’s a small enough company. Kyle Albert: Yeah, absolutely. Well, you should be able to talk to somebody there. And really, if they’re one of the big guys, you’re probably not going to be using them if you’re in a small firm. We’ve had clients come in to us and say, “Well, we talked to one of the big guys first and they said it was going to be $150,000 minimum,” and I said, “Okay.” And they said, “That’s not going to work for us,” and I said, “Well, I can understand why.” So some of the big guys, they’re dealing with massive cases and they’re just not structured to help smaller firms. Jared Correia: Alright, so let’s talk about the pricing a little bit, then. We’ve been sort of coming around to the issue, but just how expensive are we talking? And if a small firm or a solo attorney has sticker shock, how could they potentially reduce the cost of an ediscovery process? Kyle Albert: So there’s a few things you can do, and one thing – and this is why it’s important to talk to somebody up front and figure out what their model is but also what they’re offering. Because what we do at Fox Hound is we actually work with our clients to try to help them reduce the cost because we know that it’s a burden. In a small firm, or maybe you’re even a solo practitioner, your clients may not be that big, and they may not have huge pocketbooks and they’re going to feel the pain if you come to them and you say, “Look, you’re already spending all of this money in this lawsuit, and now I’m going to have to ask you to increase the budget on this because I’m going to bring in this outside company to help out with the ediscovery parts of this.” So we try to help with that. We’ll actually talk with our client’s clients and explain to them what we’re going to be doing in the case. And one of the things that helps the end clients understand is our clients, the attorneys, will say to them, “Look, you can either pay me at my hourly rate to be sifting through all these documents and kind of a manual process, or we can bring in these guys at Fox Hound and we can make the process a lot more streamlined and help us do some efficient searches through all this data, and that’s a lot more cost-effective than having me and my staff go through it by hand.” So that’s one thing, and so what we try to do is we try to help them identify the most efficient ways to collect the data from their clients and not collect too much data. One of the things that drives the cost up is when you get a ton of data that isn’t relevant to the case. And so if you can figure out how to identify as best as you can what data is really going to be relevant to the case and then try to reduce that down just to the set of documents that the attorney and his staff need to be able to review, that’ll help reduce the cost. And then there are some other things you can do when it comes to production options. We try to encourage our clients to negotiate with the opposing counsel up front, which is something you should always do in one of these cases, is work out with the opposing counsel at the beginning how you’re going to do things like productions and what format you’re going to use and things like that. And we always recommend that they try to shoot for producing in native format. Or at least mostly in native, which means the original forms of the documents as they existed on the computers, instead of what people used to do where they would say, “We’re going to turn everything into a GIF image or everything into a PDF.” That can drive up the cost as well, because now you or somebody, your ediscovery provider or you and your stuff, will have to work the computer and get all those documents converted and that can take a lot of time and that can cost money. Jared Correia: Yeah, those are great points, I think, and the point of great lawyers having to sell service providers to their clients a lot of times is sort of an undercovered issue, I think. So let me ask you this: Fox Hound, how did you come up with that name? Did you guys get drunk watching Downtown Abbey one night or something? Kyle Albert: Well Fox Hound, as it turns out, is the state dog of Virginia and we are headquartered in Virginia. And a Fox Hound is a hunting dog and they used to be used, obviously as the name suggests, for hunting foxes. And so what thought that they idea of trying to find an elusive animal that is good at hiding, we thought that related well to kind of what you’re doing sometimes in ediscovery, where you’re searching for some documents that may be hard to find. Jared Correia: Yeah, there you go, well played. I don’t know what the state dog of Massachusetts is, but now I feel inadequate, I’m going to have to go Google that. So let’s have one more question here. There’s potentially a lot of moving parts in any ediscovery process, and I know there’s no such thing as a typical ediscovery process, but from a data management standpoint, what are the major components that attorneys are trying to discover during ediscovery? Is it mostly email these days? Is it like social media information? What are you saying? Kyle Albert: So it’s all of the above. I mean, it is still largely email. So in most civil litigation, you’re usually dealing with companies, and you’re dealing with the employees of those companies, although that’s not always the case necessarily either. We’ve had clients who’ve come to us for divorce cases where’s there’s maybe a large asset involved that’s being disputed. So email is still the biggest, by far. It is starting to become more common that things like social media are being requested in cases. If maybe there’s, for example, one of our clients has a defamation case against one of the big TV networks, and social media’s a big part of that case. So there’s a lot of social media there but also the emails that were being passed back and forth behind the scenes amongst the team before those social media posts were being posted. So a lot of it really is sitting down at the beginning and thinking about – and you have to do this with your client. You really have to sit down and think about what are all the potentially relevant pieces of data that we need to try to gather related to this case, whether that could be paper documents – in some cases there’s still some paper out there. Email will probably be a big part of it, but you have to think about things like text messages and social media and voicemails, even. Things like – we’re using Skype today to do this podcast so there’s all kinds of way that digital evidence can be created. And so you have to sit down early in the case and try to identify all of that, and then thinking about where all that is being stored. Because now what we’re dealing with in a lot of the cases is companies are storing more and more data with Cloud service providers, so it’s not even on premises at the company anymore. So you have to think through that and how difficult is that going to be to collect that data and things like that. Jared Correia: Yeah, lots of challenges clearly, but it sounds like for attorneys who want to reduce the cost or make it a more streamlined process, the best thing to do is to do a little bit of lightwork on their own first. Kyle Albert: Yeah, we’ve seen a lot of attorneys who get into a mess in a hurry because they didn’t do quite enough thinking about it early on. And I get it, we’re all busy and as attorneys, especially attorneys at small firms, you’re usually juggling 28 different balls in the air at the same time. So it can be hard to carve out time early in a case when there’s nothing really pressing happening in that case. It can be hard to carve out the time to really think through all these issues, but it really does help a lot. Jared Correia: So for those interested, the state dog of Massachusetts is a Boston Terrier, which is my bad, totally, I should have known that. Other infamous state bogs, the Blue Lacy of Texas, and the American Water Spaniel of Wisconsin. Alright, well, even the most eventful podcasts on ediscovery have to come to an end, unfortunately. So it’s time for us to wrap this up, Kyle. 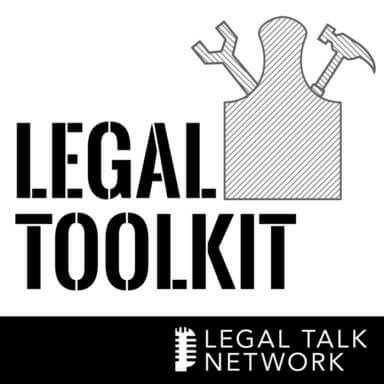 We’ve reached the end of this episode of the Legal Toolkit, but you can still check out all of our shows any time you want at LegalTalkNetwork.com. So thank you Kyle Albert of Fox Hound Information Management for taking time to come by the virtual studio today to talk about ediscovery. So Kyle, finally, can you tell our listeners where they might be able to find out more about you and about Fox Hound? Kyle Albert: Sure, so the best place to learn more about Fox Hound is to go to our website, which is Fxhnd.com, we couldn’t get any vowels there in the Fox Hound domain. And on Twitter, we love Twitter, so our Twitter handle is @FoxHoundLLC. My personal Twitter account is @KyleAlbert95, which the year I graduated college. Jared Correia: There you go. Thanks, Kyle. So play a little wheel of fortune, check out Fox Hound’s website, and we will talk to you again next month. Thanks everybody out there for listening, we’ll chat soon. Advertiser: Thanks for listening to Legal Toolkit, produced by the broadcast professionals at Legal Talk Network. Join Heidi and Jared for their next podcast covering the current business trends for law firms. Subscribe to the RSS feed on legaltalknetwork.com or in iTunes. The views expressed by the participants of this program are their own, and do not represent the views of, nor are they endorsed by, Legal Talk Network, its officers, directors, employees, agents, representatives, shareholders, and subsidiaries. None of the contents should be considered legal advice. As always, consult a lawyer.